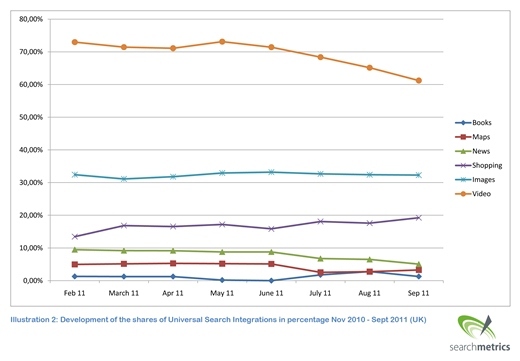 Again universal search: It has been some months, since we had a look at the development of the Universal Search integrations in the SERPs. 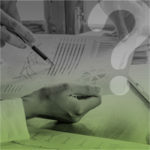 We now have new numbers from the search metrics datapool, so let’s have a closer look. Has the upper limit been reached? Let’s look first of all at the overview of the number of insertions of OneBoxes in the search results. But let us first clarify: we’re not talking about the relevance of Image Search or Google Shopping – but simply about the number of insertions of relevant universal search Boxes in the organic search results. These may be shown at the top, in the middle, or at the bottom of the first results page – and even on the following pages. When it comes to videos or images, that isn’t unusual. It is conspicuous at first glance that developments in the US and other English speaking countries (i.e. England) differ. We can probably assume that the traditionally pioneering algorithm in the US is leading the way. That is why we will have a closer look at it. Video is still the dominant universal content on the web! Who would have thought? Could it be that during the past year a lot of online marketer have worked with the topic ‘video’? One might think so in light of the many ‘video SEO’ presentations at conferences. I think, however, this development has been unrelated. Firstly, video is still a vital topic for the future – even without SEO. And secondly, Google loves video, after all: the marketing machine via YouTube has taken really off. We can on the other hand also see that videos have significantly decreased in England and slowed in the US during the summer, but bounced back. The number of images is increasing. This may be the result of the new image search option, which has been operational for a while now. Maybe Google is so proud of this feature, that ever more visitors are lured there. ‘Shopping’ shows no growth. Is there a strategic reason behind it? 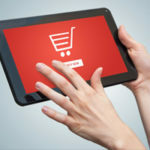 Is the intention that shopping functions should merge with the organic index, or are 1.5 million products simply too many, and Google consolidates itself to a more sensible level? Only time will tell. In England, this number has slightly increased but the US shows a downward trend. Book searches are definitely not breaking any records in terms of product numbers – at the very best they might for data suppliers. Publishing houses are simply not on the ball yet. 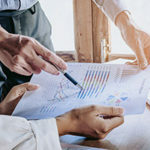 And shops prefer delivering their data to the shopping search anyway – which makes perfect sense, since it appears more frequently than the book search. We may well be looking at a Google product on the demise. Or not? Maps integrations have decreased slightly over the past months. This development throws a less than positive light on local providers, like handymen or doctors. Nationally active businesses with local subsidiaries (car rentals, hotel chains, etc.) have been active for quite a while and have been successful with it. What’s left is the news. A structural limit exists: There are, after all, only a few news stories each day so topical and in the focus of the media that there simply can’t be more integration in this area. It would, however, be very interesting to find out how much traffic there really is. Let’s get to the image with relative, i.e. percentage values. Here too, the masses of video integrations stand out: Almost 70% of all organic search requests are answered with a list of videos. 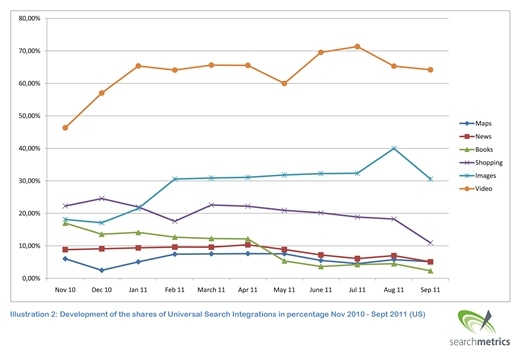 And we’re not talking about a small selection but about the longtail as well, which is monitored by the search metrics. That is really a lot! 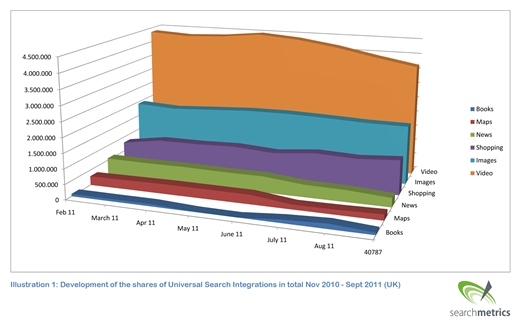 And which pages are the universal search winners? Let’s get to the honors for the busiest universal search pages. A lot has happened during the last quarter. The biggest surprise has been that eHow has had a strong increase in terms of videos in both the US and UK – after all, the page has been significantly impacted by the Panda update (see image). 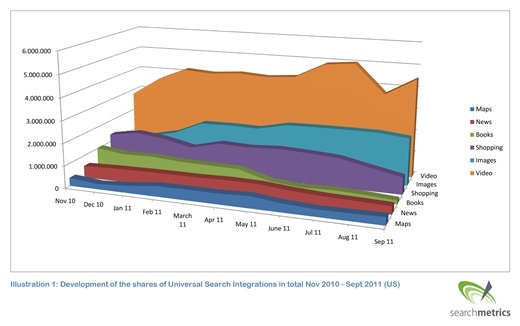 Demand media may have recognized the potential of universal search to counteract the traffic losses caused by Panda. 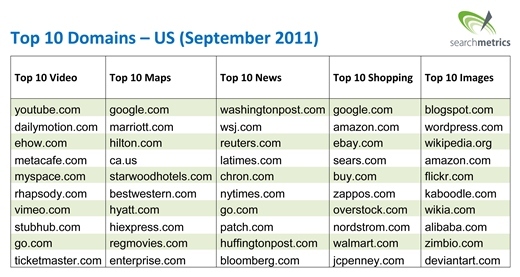 And the high input by Amazon and Alibaba.com to image searches shows the top sites are focusing resources on images, usually a good signal for the rest of SEO professionals. Very interesting statistics.. are they also available for other countries like Germany or France? a visit thiis web site, it contains priceless Information.